Glucerna products are dietary supplements from Abbott Nutrition, and choices include cereals, meal and snack shakes and bars. They are designed for individuals with diabetes, but they may be good for you even if you do not have diabetes. Talk to your doctor before using Glucerna products or any dietary supplements to make sure that your diet is nutritionally adequate. Although it is always best to get your nutrients from whole foods and not from supplements, Glucerna products provide low-calorie options that may help you lose weight even if you don't have diabetes. Glucerna meal replacement bars, snacks and shakes can help you lose weight by reducing calorie intake if you are already within a healthy weight range, or to lose weight if you are overweight or obese. Glucerna shakes and bars have about 100 to 200 calories each, according to the Glucerna website, so you can use them as a snack or meal replacement to lose weight. However, a healthier approach to weight loss may be to eat fresh foods, such as fruits, vegetables and beans. Glucerna products are fortified with vitamins and minerals that help you meet your nutrition needs even if you are not diabetic. 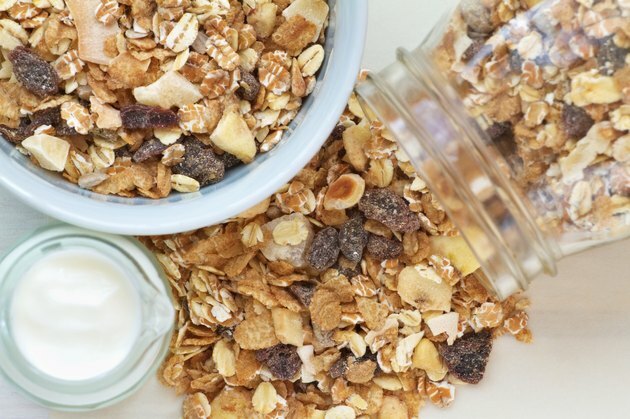 The shakes, bars and cereals are good sources of most of the essential vitamins and minerals. A traditional Glucerna shake has 190 calories with 10 g of protein and 3 g of fiber. The shake contains 25 percent or more RDA for for iron, calcium, magnesium, folate and vitamins A, B-12 and D. The carbohydrate content of 23 g is from sugar alcohol, and not sugar, says HealthLine. A Glucerna shake has 380 mg of potassium, which is about 11 percent RDA. According to the USDA Dietary Reference Intakes, most adults require between 46 and 56 g of protein daily. If you are not getting enough protein in your diet, the high-protein content in Glucerna may help. The Hunger Smart diabetic shakes contain 15 g of protein per serving. However, natural protein sources may be a better option. Fish, poultry, tofu, lean red meat, beans, and legumes are great sources of natural protein. Many meal replacement bars are available for weight loss but most contain a lot of sugar. What makes Glucerna different is that it is lower on the glycemic index, which means that the carbohydrates do not lead to spikes in your blood sugar levels. Glucerna diabetic shakes are designed to help regulate your blood sugar if you have diabetes. A high-glycemic diet can increase your risk for diabetes, according to the Linus Pauling Institute Micronutrient Information Center. However, Glucerna states that its product-based meal plans are designed only for individuals with diabetes, and you should consult your doctor for a more suitable program if you do not have diabetes. Glucerna products may have some benefits, such as providing whole grains and dietary fiber from its cereal. NutritionFacts.org says, on average, Americans only consume about 15 g of fiber a day, while the daily requirement is 31.5 g, so that's less than half the minimum. However, Glucerna advises against using its cereals if you do not have diabetes, although the company does not specify why. Whether or not you have diabetes, the safest approach is to consult your doctor about your health needs. Read More: Can Protein Powder Be Used to Replace Meals? NutritionFacts.org: Where Do You Get Your Fiber? HealthLine: Does Glucerna Work for Diabetes? Why Can't Diabetics Drink Cranberry Juice?